What percentage of patients visit their doctors due to muscle, joint or bone conditions? According to reputable sources, nearly every household in America is impacted. 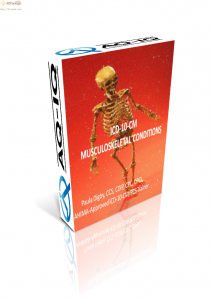 This session focuses on coding and documentation of conditions of the musculoskeletal system. Review this course to hear Paula Digby explain the nuances of coding and documenting these services using the ICD-10-CM code set. An overview of the musculoskeletal system and how it operates.